Similar to the recent Bookie Comparison feature, I am pleased to announce the addition of DFS (Daily Fantasy Sports) functionality to Golf Predictor. This new feature was suggested by a user and is available from the new Rankings (DFS) page on the Predictions menu. It is a visual comparison of the GP rankings with the DFS golf salaries/rankings for a tournament, where the DFS golf information is sourced from DraftKings, currently the biggest name in DFS golf. In addition, DraftKings make their salary information available via a downloadable CSV file, which makes my job easier! DFS golf is exploding in popularity, so I was only to happy to add some useful functionality to Golf Predictor to cater for this growing market. As can be seen in the first screenshot above (yes, I know you can see some stats for free!!) 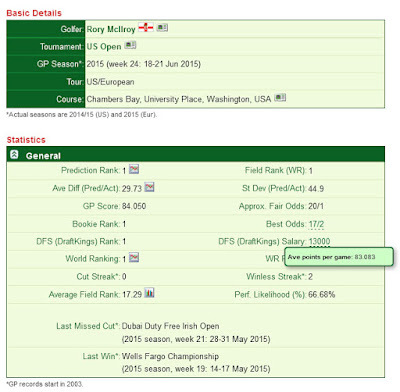 for the 2015 US Open, the new Rankings (DFS) page has a DFS Rank ("D Rk") column and a Salary ("Sal($)") column which is colour coded. Undervalued golfers are shown in green, with deeper shades representing better value. Similarly, overvalued golfers are shown in red,with deeper shades representing worse value. Golfers ranked about right by DraftKings (according to Golf Predictor!) are shown in yellow/gold. Hovering over the salary column will show the average points per game by the selected golfer. For tournaments with this new DFS information, a new row has been added with the same information to the General panel on the 'Prediction Data' page for each golfer. 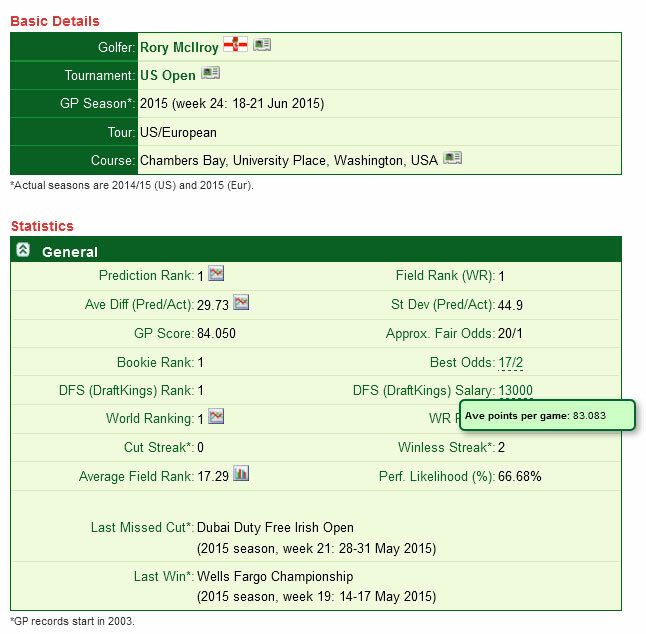 This is shown in the second screenshot above for Rory McIlroy, also for the 2015 US Open. On this page, the DFS rank and DFS salary are shown directly and the average points per game is again shown in a pop-up box. If a golfer is not matched (i.e. DraftKings do not have him listed for the tournament), his DFS rank will default to 500. This allows for better sorting of that column in the table. If the golfer is not matched, the DFS panel row in the Prediction Data page is hidden for that golfer. I plan to leave the DFS information in the system until the end of the GP season, after which it will be deleted and replaced with the data from the new season. Further to the above point, I hope to add several new DFS charts shortly, which will show things like a golfer's DraftKings salary over the course of the season. In order to have this functionality ready for the US Open, there wasn't time to include them at this point. Also, I have currently only one week of DraftKings data so there isn't enough to chart salary trends yet! This DFS information is only available for US PGA Tour events from the 2015 US Open on. On Golf Predictor, this corresponds to tournaments with a Tour value of "US" or "Both". Further to the above point, all matching tournaments for the current season with this DFS information are automatically shown in the Tournaments dropdown list, regardless of whether it is a US only event or is on both tours. Due to the above points, you can not change the tour or season dropdown values on this new Rankings (DFS) page. It will always just show the current season US PGA Tour events, so there is no need to change them (unless DraftKings starts covering European events!)! They are there for display purposes only. DFS stats are calculated based on the wraparound US PGA Tour season, while Golf Predictor season stats are calculated based on the GP Season (calendar year). This functionality works by comparing the DFS rank with the GP rank. Golfers with a higher GP rank than bookie rank are considered undervalued and vice versa. As this functionality increases my weekly workload, it may or not be available for some or all future tournaments. If enough people find it useful, I'll do it for as many tournaments as possible. Otherwise, I may just do it for the bigger events. When available, the DFS comparison will appear on the Monday or Tuesday of the tournament week, depending on the availability of the DraftKings information. A colour code table is displayed on the new Rankings (DFS) page, as shown in the first screenshot above. I have added affiliate links to DraftKings on the site and on this post, so please use them if you are thinking of signing up to their site. You may have to refresh a golfer Prediction Data page to see the changes. I trust you will find this new premium DFS Golf feature useful. Any feedback (via comments on this article or email) would be most welcome. Like other premium features, non-subscribers can only see this DFS golf comparison information for golfers ranked 11-25 in the prediction rankings. Therefore, sign up today and reap the full benefits of Golf Predictor, the premium professional golf statistics site. This DFS functionality has been enhanced. Please see this blog post. Thanks for that. You're welcome and glad you're finding the fruits of my hard work over over the past week useful! I hope to add a few related charts soon, so watch out for those. DFS charts now added, including one great zoomable one which shows DraftKings value at a glance. See this blog post for more info. "Fair" salary added to DFS page. Please see this blog post.